Cute item - nice labels - I made a good choice. Cute measuring tape. I want a party favor to be useful or consumable. This is useful - something you can carry around in your purse. How many times have you been out and wish you could measure something? 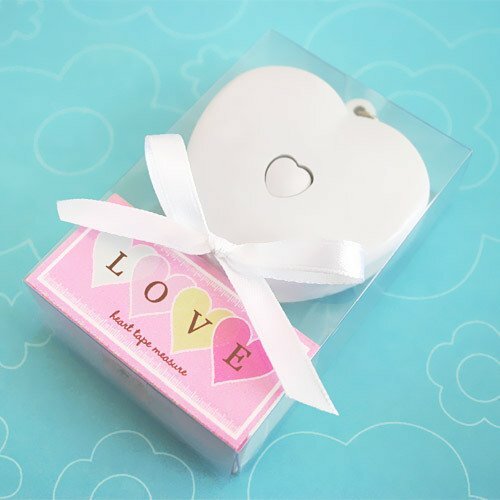 The measuring tape comes in a simple see-thru box with small satin ribbon on the front, and a colorful "LOVE" insert at the bottom of the box. If you order custom labels, you take the tape out of the box, put on the custom label, and re-insert the tape in the box. You can see both sides of the measuring tape and your attached custom label thru the clear box. My order included extra custom labels, which is helpful if you accidentally damage a label while removing it's backing. Order early enough to have your customization completed and still receive your measuring tapes on time. I thought about whether or not to get these and finally bit the bullet and placed my order. I'm pleased with what I received - it's a nice bridal shower favor. Really Cute and Useful at the same time! Product received in great condition and in plenty of time for the bridal shower. Used as one of the bridal shower favors. Liked by all including the bride. A momento of special event and a functional item. Used this item as part of my daughter's bridal shower favor. 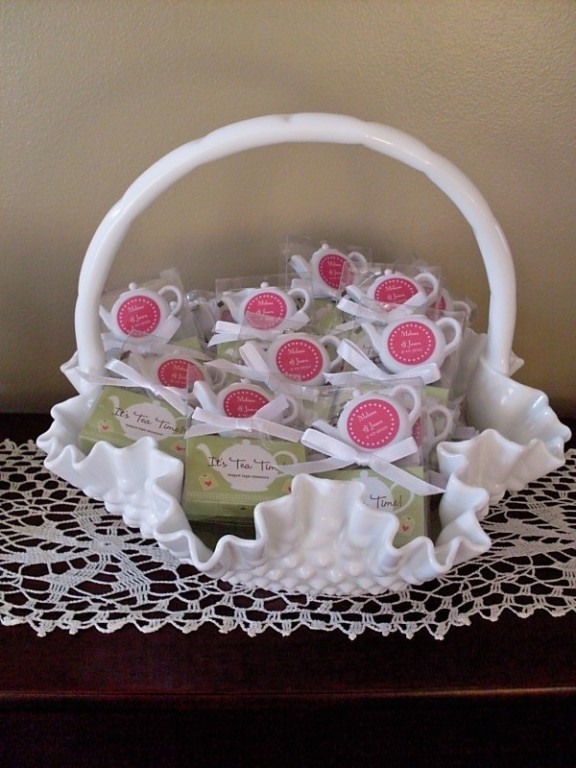 PERFECT gift for a Tea Party Shower!! 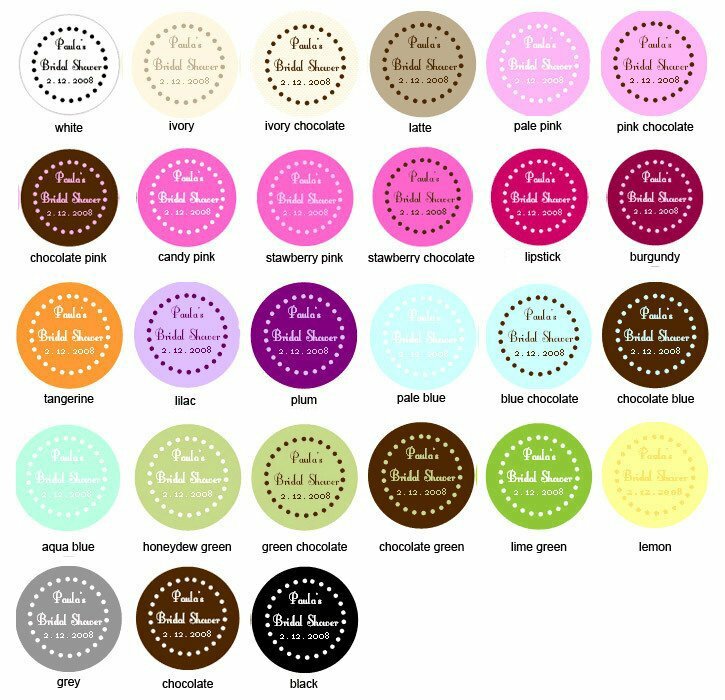 Looking for a clever favor for a Bridal Shower given at a local tea room, I found these online. Being able to customize with the perfect color to match the bridesmaids' dresses and to personalize with the bride's name and shower date were added bonuses! Thanks. Highly recommend. Adorable as well as useful keepsake. My daughter's Bridal Shower was at a Tea Party Parlor. I bought the Tea Pot tape measures as a party favor. They were adorable, even the owner of the parlor commented on them. I didn't realize when I first found them, that the tape measure was also a keychain. What a cute idea, now I can take it with me wherever I go. It is a constant reminder of my daghter's fabulous Bridal Shower. I gave these as favors for my sister's 50th birthday (tea) party and everyone loved them. In addition to fitting perfectly with the theme, the measuring tape and key chain make them practical as well. I love the dual purpose use of it, serves as both key ring and tape measure. Cute, but they are smaller than they look. They are about 1.5" high by 2" only from tip of the tea spout to the handle. I also didn't realize that they were key chains which detracts in my opinion. It is not clear in the description but if you look closely you can see it in the picture. The personalized label definitely adds a lot. It was exactly what was pictured ! I would order again from this company. We used the items for favors at a themed Bridal Shower. Everyone loved them. One of the children there was particularly fond of them, because it made her feel like Mary Poppins, who pulls a tape measure out of her big bag full of all sorts of mysteries. How precious is that!! Good for favors at a tea party! !, so useful ! Everyone loved the Teapot measuring tape. They especially loved them because they are useful and the personalization gave them a memory. gave an extra unexpected touch. Really fit the theme. I was a hostess at our church spring tea. These items were used as favors for my guests, and they were a huge hit. the heart shape "measuring tape" favor was chosen as a fun gift. Also for the reason, not very many women carry measuring tapes. This tape measure can be carried in a purse, and used when whenever needed, when out and about. Was well liked but it did not "snap back" as well as I had hoped for a tape measure. The teapot tape measure was a perfect gift for the guests of a very special old-fashioned tea party. I put the tape measures together with small had lotion and small candy pack - all wrapped up in tissue paper with a nice ribbon. Placed each on the tables at each seat. All loved them. Everyone loved this shower favor! The tape measures were very cute & useful too!Lots of people asked what company they were ordered from.Everyone loved the fact they were a great remembrance of the occasion.They were small enough to not clutter anyones purse or life!The selection of colors was great. Personalization was very cute!They were good reminders of this special event and affordable too![... ]Great Service. Staff helpful and reliable!A pleasure doing business with you! these functional and personlized tape measures were given as party favors at the bridal tea party for my daughter and everyone loved them and said they could use them and carry them in their purses or on key rings. they were just great!!!!! Bridal Party Favors a Hit! Look cute and also functional. The tape measures were functional and cute. We did a British tea party wedding shower so they went with the theme very well. No bad comments received everyone enjoyed them. Perfect favor for Ladies Retreat! This measuring tape came in a cute box with "Love" on it. It was perfect for the Ladies Retreat that talked about the full "measure" of God's love! Great product, glad I ordered it! product was hard to read. Should have been in BOLD print. Pricing was in line with the product ordered. The tea pot design in adorable! These useful teapots are part of the guest gift bag items for a Ladies Tea Party/Bridal Shower. I had them personalized with: Addie's Tea Party and the event date. They are cute as can be! Q:Can the pink on the tape be changed to a different color? A:Unfortunately, the tape measure is defaulted to pink text. Q:Where are the line breaks for the lines of text? There are three lines of text in the picture example, but only two text boxes provided in the customization form. Q:what are the dimensions of the box that teapot tape measure is in? A:Size of finished favor: 2.25" x 3.2", Size of tape measure: 2". Tape measure length: 36"-39". Each retractable measuring tape comes shaped like a heart or teapot—take your pick! 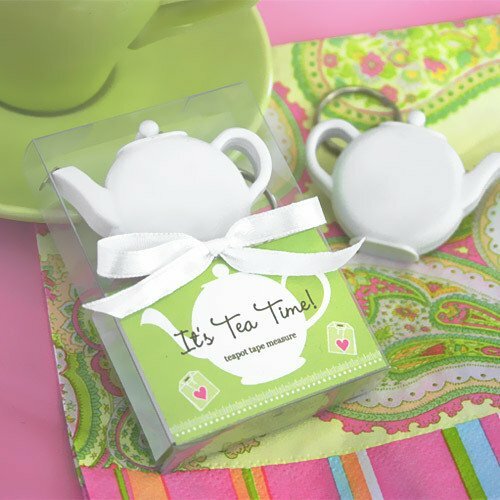 This fun favor doubles as a key chain and arrives prettily packaged in a clear box with the word "Love" (heart-shaped favor) or "It's Tea Time!" (teapot-shaped favor) in a colorful design. For personalized orders, choose a label color to match your theme and add a special message to your guests. Minor assembly required, labels ship flat to prevent damage during transit. Both favors measure approximately 2" in diameter and pull out to be 3 feet long. Boxed, the heart favor measures 2"W x 3.2"H and the teapot measures 2.25"W x 3.2"H.
For a traditional look, select our measuring tape key chains. For more personalized label options, see our personalized designer labels.